The flower that always sends a smile, Gerberas daisies are full of friendly charisma and make any occasion a happy one. Freshly cut Gerberas and miniature Gerberas are arranged in a clear glass vase with salal and seeded eucalyptus. A vivid mix of bold primary colors, the daisies are the perfect choice for birthdays or any festive celebration. Measures approximately 13" x 15". Gerbera Brights Bouquet is a hand delivered gift. These gifts are delivered by one of our local design centers located throughout the United States and Canada. Same day delivery is available for most gifts when ordered before the cutoff time. 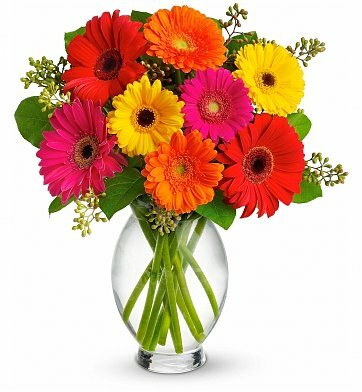 The cutoff time for Gerbera Brights Bouquet is 2 PM in the recipient's time zone. The arrangement was beautiful, delivered on time, easy online ordering. They were bright and fresh flowers, they brought a sad recipient to happiness.